In a crowded field of subcompact cars, the 2019 Chevrolet Spark stands out due to its comfort features and nimble driving in nearly any road condition you can imagine. If you’re looking at purchasing a new subcompact car, then this year’s Chevy Spark should definitely be one of your top considerations. Though a few of the features of the Spark have already been mentioned, what exactly sets the Spark apart from other cars in its class, and how does it compare to other vehicles? There are quite a few technical aspects and interior features to get excited about, but there are some downsides to the Spark as well. The Spark’s second generation was released in 2015, so most changes to the 2019 Spark are quality of life, minimal differences. The largest difference is in the exterior design of the Spark, where the front end of the car has a new grille and new headlight designs. The wheels have also been redesigned for efficiency on the road. On the interior, the Spark has gotten an upgrade to its infotainment system and now has two USB ports for charging your phones or tablets. 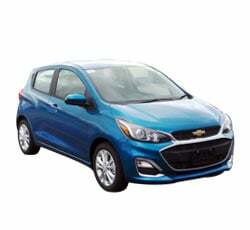 One of the most appealing features that subcompact cars offer is their top of the line fuel economy. The 2019 Chevrolet Spark definitely fits into this category, offering a base 29 miles per gallon in the city and 38 miles per gallon on the highway. If you upgrade to the continuously variable transmission (or CVT), that fuel economy ramps up a bit more to 30 mpg in the city and 38 on the highway. This fuel economy is not just a number posted by Chevrolet, either - the Spark easily manages this mileage, especially in cities with traffic. The 2019 Chevrolet Spark managed to score in the highest demographic on all safety tests, a feat not often performed by mini-cars. In the side crash test and the front overlap test, the Spark scored the highest possible marks given by the IIHS. This is mostly due to the plentiful safety features packed into the car. These features include roof rail airbags and pelvic airbags to shield passengers’ bodies fully in the event of a crash, rather than just protecting the head from injury or whiplash. They also include a rear camera to assist with parking, stability control, forward braking assistance, and alert systems for both front collisions and lane departure. In combination, these features lend both the Spark and the driver the utmost control on the road. Perhaps the most enticing feature of a subcompact car this tiny is its ability to dart around tight spaces. The Chevy Spark is able to fly around cities (safely, of course), navigating through tight squeezes and turning on a dime. Its turning radius is extremely small, letting you park in spots that would be unreachable by normal vehicles. Its secure and stable on the road, which allows you to make split-second decisions about switching lanes if necessary. Once you’ve made that decision, slotting into the next lane over is easy as can be due to the diminutive size of the Spark. One area that mini-cars tend to fall behind in is in the interior technology. Because so much effort is diverted toward exterior design and fuel efficiency, some of the interior design choices are relegated to a lower shelf. However, the 2019 Chevrolet Spark’s interior technology is at least up to the same standards as full-size vehicles, if not better. The infotainment screen measures in at 7 inches, and includes a 4G LTE Wi-Fi hotspot. There’s a built-in navigation system, but you can also sync your smartphone through Android Auto or Apple CarPlay depending on the device and OS you use. Two USB ports round out the technology front, offering power to charge any small devices you may have with you in the car. The 2019 Chevrolet Spark’s sound system is a six-speaker system that is balanced throughout the vehicle. Though the sound is not the highest quality of audio that you may find in higher-end cars, it still is powerful enough to blot out any road sound that may creep into the car’s interior. The sound is also balanced well out of the box, meaning that you don’t need to tweak the system too much to achieve a pleasant sound. You can listen to anything from heavy metal to audiobooks quite easily in the Spark. At first glance, the Spark does not seem like it has much cargo space. This is somewhat true, as that space measures in at just over 11 feet with the rear seats up. However, when the rear seats are folded down that cargo space jumps to more than double the 11.1 feet offered by the rear only. With the seats down, cargo space is a massive 27.2 cubic feet - enough to fit your vacation bags and more with ease. The 2019 Chevrolet Spark has four distinct models available. The base model is known as the Spark LS and offers most of the previously mentioned features - 15-inch wheels, interior technology, and multiple exterior color choices. The next step up is the Spark 1LT, which adds quite a few quality of life upgrades. For example, the 1LT includes cruise control and power windows, as well as LED daytime lights and keyless entry. The Activ model is slightly more rugged than the 1LT, offering a softer suspension for more advanced maneuvering. It also includes roof rails and heated seats. The top of the line Spark model is the Spark 2LT, which contains plenty of comfort features. In the 2LT, the seats and the steering wheel are wrapped in leather and the interior technology includes enhanced safety features. Some mini-cars can look odd on the road, appearing horizontally squished and diminutive while driving. The Spark keeps Chevy’s signature looks while adding some subcompact flair, not appearing strange to the inexperienced eye at all. The exterior of the 2019 Chevrolet Spark is bold but is aesthetically pleasing in its proportions and lines. The engineers at Chevy ensured that the aerodynamics of the Spark did not detract from its looks, making the exterior lines flow smoothly throughout the entire body of the vehicle. The rear of the car is flat but does not just cut off those lines like many other vehicles with the same rear design. If you’re of above average height, then you may be worried that subcompact cars will leave you hunched over and uncomfortable. The 2019 Chevrolet Spark subverts this expectation with its extra-high roof, allowing passengers and drivers of all sizes to feel comfortable in the car. This attention to taller drivers also extends to the legroom - drivers and front seat passengers have enough legroom to feel comfortable on even long drives. Because the 2019 Chevrolet Spark is a mini-car that is designed to drive efficiently in cities, there is a particular attention to the vehicle’s visibility. The Spark’s windows extend past where you would normally expect car windows to be, giving you enhanced visibility in spots that would be completely blinded in other cars. In combination with the rearview camera and the parking assistance, the enhanced visibility lets you maneuver safely and confidently no matter the situation. The Spark can only do so much with its 98 horsepower engine. When the car is full with a driver, three passengers, and some groceries in the back, the car struggles to get up to speed in a timely fashion. This struggle disappears with fewer passengers, though - with just a driver and one passenger, the Spark feels zippy on the road. Another downside of the 98-hp, 94 lb-ft torque engine is the somewhat slow acceleration of the Spark. The subcompact takes around 11 seconds to accelerate from 0 miles per hour to 60. This makes it a chore to merge onto highways, especially when merging lanes are short. The longer you drive, the easier this will be to manage - but upon test driving, the slow acceleration takes some getting used to. Though the front seats of the 2019 Chevrolet Spark offer plenty of legroom, the backseats feel quite cramped. Adult backseat passengers (and even teenagers) will definitely not feel comfortable on long rides. This is somewhat manageable due to the comfort of the seats but is not a factor that is easily ignored. The 2019 Chevrolet Spark slots into the mini-car/subcompact class with ease, though it does have some stiff competition. The Mitsubishi Mirage is the closest competitor to the Spark but does not have the same features or comfort as the Spark. Perhaps the most tempting competitor of the Spark is Chevy’s own Sonic, but the Sonic is significantly bigger and cannot be considered a mini-car. The Mini Cooper may be a tempting choice, but the Spark offers many of the same features for a significantly cheaper price point. If you’re considering a mini-car or subcompact car as your next purchase, then you should definitely be considering the 2019 Chevrolet Spark. This nimble vehicle feels fantastic on the road, and drives are enjoyable with the interior technology provided. There are a few downsides - namely the engine’s small size - but the safety and comfort provided by the Spark easily make this one of the best mini-cars on the market.